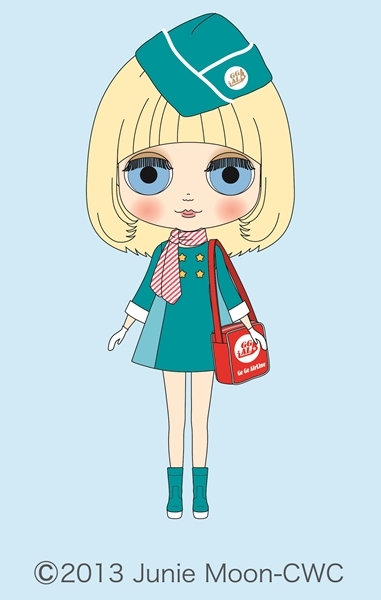 Our cheerful flight attendant "Miss Goody Girl" is here to help you on Go-Go airlines. She'll make your flight from London to Kona a smooth and easy one. Let her take care of you! 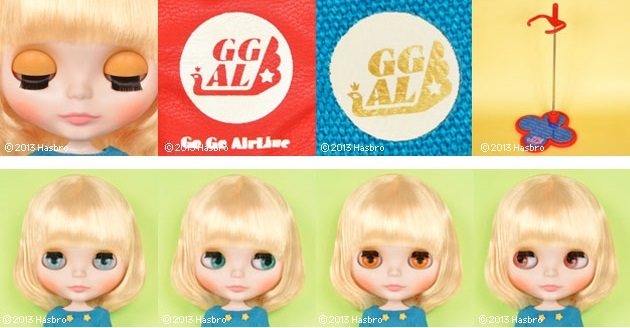 Go-Go Airlines uses light blue to reflect the image of the sky. Her hat, dress and boots are reflect the friendly color. Her uniform is a clean A-line dress with contrasting light blue panels on the sides. She has white cuffs on the dress that adds to her smart look. There are four cute star buttons on the chest that gives it a total cute and retro feel. She has a sweet white and red striped scarf that can be tied in a variety of ways to give different expressions. 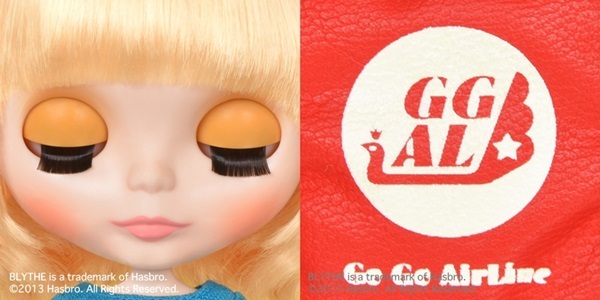 Her cap and red flight bag has the logo for Go-Go airlines. 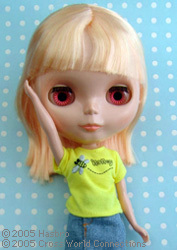 She has a blonde, short, soft bob hairstyle. She has natural brown eyeshadow, and salmon pink lips and cheeks. 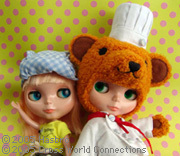 She has two special eye colors: light blue (front) and light green (right). She has Radiance + face mold. Make-up: Brown Eyeshadow, Salmon Pink lip and cheek. Set Includes: Doll, dress, hat, scarf, bag, gloves, boots, and stand. 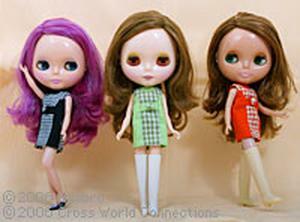 Team Sibley’s doll became an official CWC produced Limited edition Blythe doll. 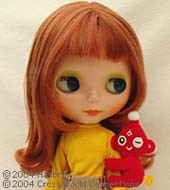 We kept the soft and innocent image of the original doll and the final product is truly something beautiful! Like the Grimm story of Henzel and Gratel, River lives in cottage in the forest and lives together with her favorite animals. 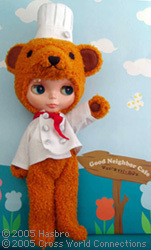 Because River loves nature, her outfit is designed for outdoor play, but also very cute play! Her one-piece dress, apron, coat and work-boots are perfect for her afternoons in the forest. The top of the dress is polka dotted with a cute flower pattern accent on the skirt, making a very cute combination. On the puff sleeves, there is heart embroidery which makes the dress very lovely to wear by itself. River's hearty apon can be worn over her dress. It is embroidered with images of her forest bird friends. 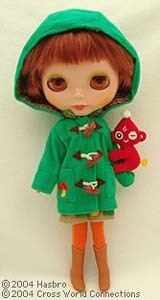 Her gorgeous dark green wool coat is decorated with appliqu? of her animal friends the fawn, rabbit, bear, owl, and squirrel. 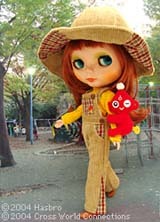 The red and brown crochet cap frames her lovely face; the look is topped off with her work boots. 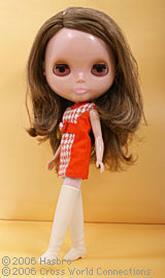 River has slightly curly shoulder length hair and her bangs highlight her beautiful eyes. Her hair color is a special mix of dark and light to express the deep red color of the leaves in autumn. Her make-up is bright red lip and reddish cheek. Her eyeshadow is a lovely dark green. To keep the soft image of the face, we have used special eyelashes. 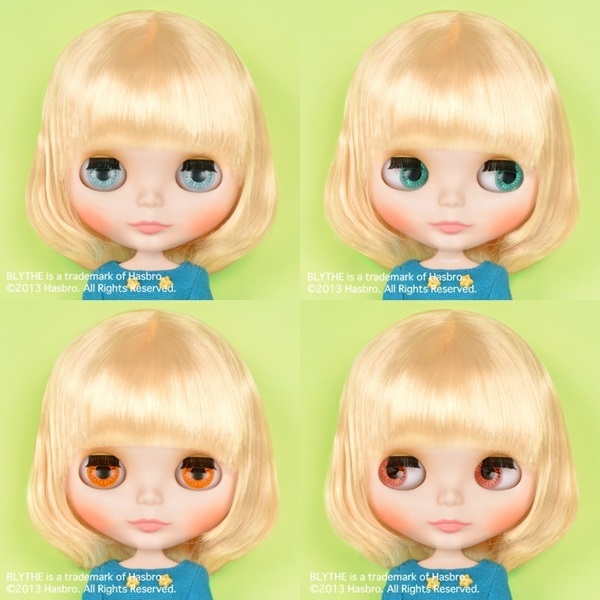 Eye colors are light grey (Right), default pink (Forward), light blue (Left), and light green (Forward). 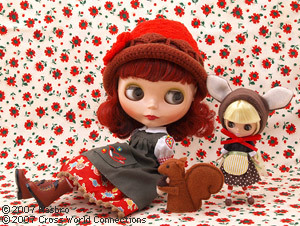 Doll (Radiance), crochet cap, coat, apron, one-piece dress, socks, stockings, underwear, boots, stand, and collection card. 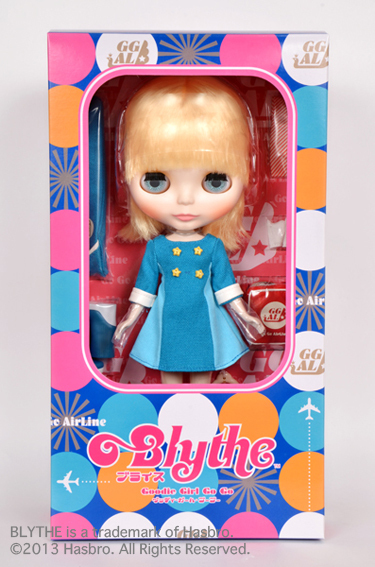 *Petit Blythe is not included. 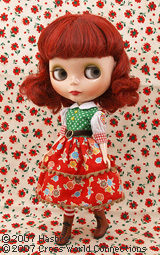 CWC limited Neo Blythe "Gentle River"